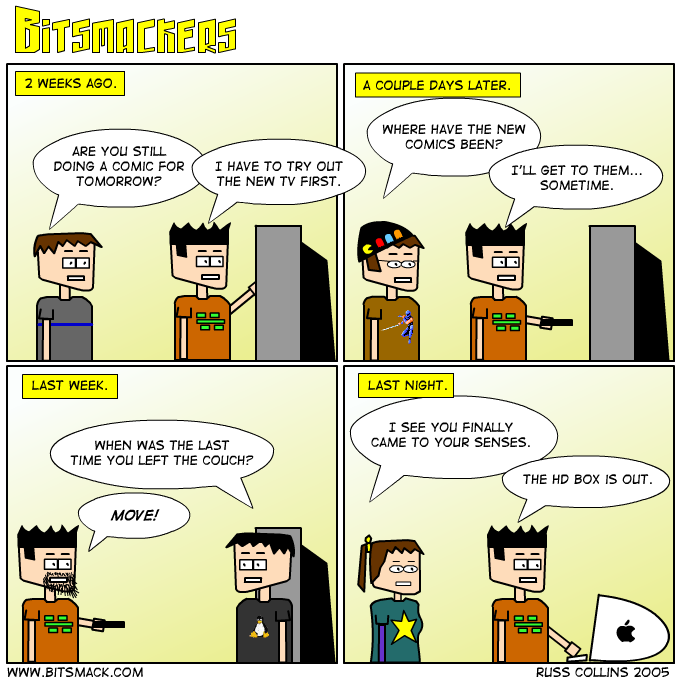 Just in case you were wondering <a href=http://www.bitsmack.com/modules.php?op=modload&name=Comics&file=index&action=comic&id=444>this is why there hasn’t been a comic.</a> Today’s comic features special guest stars <a href=http://www.geocities.com/rogerdevo/>The Raj</a> and <a href=http://rantswithpants.8m.com/>Heather.</a> I’ll let you figure out which is which. So yeah I finally got the TV I always wanted. Having HDTV for the first time I found myself watching anything that was in HD. Suddenly Trading Spaces and The District seemed interesting. Now that the novelty has worn off I have gone back to World of Warcraft. Brad and I have just created new characters on the server BloodHoof.